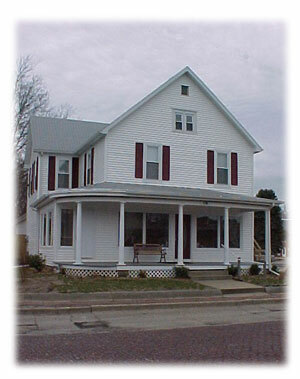 The home is two stories with a large, rounded front porch to welcome guests into the home. The downstairs features a large formal receiving room, a work hub and a study, which serves as a transition area separating the public portion the home from the private living area. The back half of the home is set up in the manner of a great room including the kitchen—the heart of every home—the dining area, and a large family room. Off the great room is a private bedroom and bath for the resident assistant. From the center of the house, a stairway leads up to four bedrooms and a bath for the women and the children who will be living there. Outside, a fenced play area for the children sits below a huge shade tree.